Since Michelle Obama has become First Lady, Oprah has interviewed her perhaps half a dozen times. Even though Oprah campaigned for the Obamas back in 2007 at a critical time, Oprah NEVER demands that they repay the favour by being interviewed because Oprah seems to consider the Obamas sacred, describing the President as a brilliant black man and the First Lady as a RADIANTLY brilliant black woman. Oprah has a reverential worshipful attitude towards blacks she considers brilliant, eloquent, and historic. When she bought the movie rights to Nobel prize winning Toni Morrison’s book Beloved, she told her agent to give Morrison however much money she wanted. “That’s not how it works,” explained the agent. “That’s how this will work,” explained Oprah. Oprah’s razor sharp business instincts fly out the window when she is dealing with historic blacks who she worships like Gods. So she wouldn’t dream of disrespecting Morrison by negotiating the value of her divine work of literary art, and she wouldn’t dream of disrespecting the First Lady by demanding favours be returned. So what is the First Lady’s IQ? Although First Lady Michelle Obama is black, and these tend to score low on IQ tests, Michelle shows two major signs of intelligence. She has a brilliant husband, and she’s super tall. Both the IQ of one’s spouse and one’s own height are positively correlated with IQ. Michelle Obama has so much in common with morning host Gayle King Bumpus. Both are famous for their close relationship with a brilliant historic black. Michelle is the wife of America’s first black president, and Gayle is best friends with North America’s first multi-billionaire black (Oprah). In addition, both Michelle and Gayle are extremely tall black women. Gayle is a 5’10” female black boomer with a 140 IQ best friend, and statistics show such people tend to have IQs around 120. Similarly, Michelle is a 5’11” female black boomer with a 135+ IQ husband, so statistics would predict that she too likely has an IQ around 120. Individuals don’t always fit the demographic expectation so it’s useful to look at some other evidence. Michelle Obama claims to have skipped the second grade. Skipping a grade is a rare and huge achievement that not many people can claim. It suggests that age seven, Michelle was intellectually functioning like at least an eight year old, and thus was mentally developing at 114% the normal rate, implying a ratio IQ of 114 (ratio IQs are valid within the range of IQ 70 to 130, but tend to give silly results beyond those limits). It should be noted that IQ 114 is a very conservative estimate for Michelle because grade skipping is very rare even for people with IQs above 114, so 114 should be considered the MINIMUM IQ Michelle could have. If my future were determined just by my performance on a standardized test, I wouldn’t be here. I guarantee you that. According to CBS News, when Michelle was growing up, she was never a great standardized test-taker, but because of Straight-A grades and a strong essay she ended up attending Princeton University. It is so great that Michelle admitted this, because she gives hopes to so many millions of blacks who also don’t score high on standardized tests, that they too can some day shine as brightly as the First Lady. To describe [the thesis] as hard to read would be a mistake; the thesis cannot be ‘read’ at all, in the strict sense of the verb. This is because it wasn’t written in any known language. So based on her self-proclaimed unimpressive test scores and based on the bad reviews of her Princeton thesis, it seems safe to say Michelle’s IQ is lower than the average Ivy League student. Since the average Ivy League undergrad has an IQ of around 122 (when measured on tests NOT used to select them), then 122 seems like the maximum IQ Michelle could have. With a maximum IQ of 122 and a minimum IQ of 114, an IQ just under 120 sounds like a reasonable guess for Michelle Obama. Although IQ 120 is a bit below the Ivy League average, it is still higher than 99% of black America and higher than 90% of white America. An IQ of 120, especially when combined with charisma and outstanding character, more than explains why Michelle is so admired by so many. As the Queen of All Media, Oprah understood better than anyone that powerful people are constantly burdened by those who want to use them for something, so as mentioned above, she very shrewdly decided to never use the Obamas for ANYTHING. Over the years, the Obamas may have realized that Oprah, who campaigned for them long before anyone thought they had a chance of reaching the white house, was one of their very few true fiends. This may help explain why Oprah was recently invited to the white house to have a special conversation with Michelle. Many years ago I wondered if it was possible to estimate a person’s IQ from physical and demographic traits. A member of the Prometheus society suggested I use a fascinating technique called multiple regression and I am indebted to him for introducing me to the math. I suggested we try to co-write an article on the subject in the prestigious peer reviewed academic journal Intelligence which I have dreamed of publishing in since childhood (I’m now in my thirties). He thanked me for asking, but was not comfortable putting his name on something that was not well researched, and so for well over a decade, the concept stayed on the shelf. However when I realized that others in the field were already using multiple regression to predict IQs from demographic variables, or simple regression to predict IQs from a biological variable, I decided it was time to publish our method, which combined both approaches. Several commenters here have expressed an interest in Angela Merkel’s IQ, including blogger AKarlin, and blogger Alcoholicwisdom so in part 1 of this series, I use a biodemographic approach to estimate her IQ from her three most extreme demographic and physical traits: Academic success, power, and physical coordination. Merkel worked and studied at the Central Institute for Physical chemistry of the Academy of Sciences in Berlin-Adlershof from 1978 to 1990. After being awarded a doctorate (Dr. rer. nat.) for her thesis on quantum chemistry, she worked as a researcher and published several papers. According to Wikipedia, The German Academy of Sciences at Berlin (abbreviated AdW) was the most important research institution of East Germany, and in the 1980s (near the time Merkel was there), had no more than 176 East German members. Thus, the median ranked member of the AdW was roughly the 88th most academically accomplished person in East Germany. Let’s say there were around 17.068 million East Germans when Merkel was at AdW, and 2/3rds were adults, and Merkel was the 88th most academically accomplished of these. Thus, relative to East German adults, Merkel had a normalized Z score of +4.33 (one in 128,000 level). Academic success seems to correlate between 0.5-0.6 with IQ. In the United States, since by the late 1970s, IQ correlates 0.57 with IQ, and the correlation between IQ and grades appears to be 0.54. In a recent post, I very crudely estimated the correlation between IQ and college attended to be 0.5, and that was probably an underestimate. Overall, the correlation between IQ and academic accomplishments is probably 0.57 in the United States. Assuming the correlation is similar in Germany, then Merkel’s academic Z score of +4.33 implies an IQ Z score of 0.57(+4.33) = +2.47 or roughly 137 (white norms). 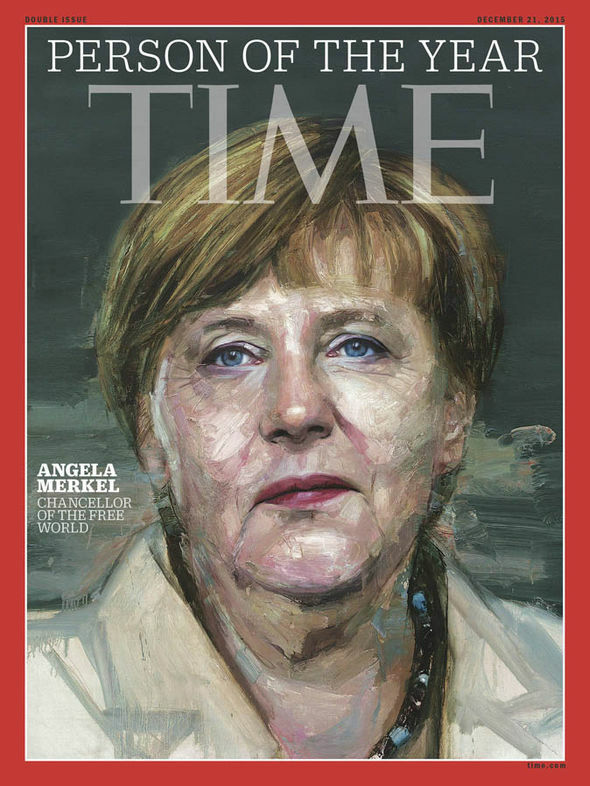 Based on academic success alone, we can expect with 95% certainty that Merkel’s IQ is between 113 and 161. Angela was physically clumsy—she later called herself ‘a little movement idiot.’ At the age of five, she could barely walk downhill without falling. ‘What a normal person knows automatically I had to first figure out mentally, followed by exhausting exercise,’ she has said. According to technical studies by the U.S. Department of Labour, IQ and physical coordination correlate 0.35. Scholar Arthur Jensen has put the figure at a potent 0.7, but that sounds impossible given the validity of the “dumb jock” and “clumsy nerd” stereotype. We should expect physical coordination and intelligence to be correlated because they’re both functions of the brain, but since only intelligence is a function of the mind, the correlation should be modest. Statistically, we’d expect Merkel to have an IQ of 137, 133, or 90, depending on whether we estimate her IQ from her education, power, or physical coordination respectively. All of these predictions carry large margins of error, so it’s interesting to ask what happens when we combine them. As the Promethean once told me, it’s not enough to know each variables correlation with IQ, we must also know each variables correlation with one another, and thus we get the following correlation matrix. Many of these correlates are very crudely estimated. For example the correlation between academic success and power is derived by noticing that U.S. presidents are about 44% as academically successful (in Z score units) as they are powerful. The correlation between academic success and coordination is derived from assuming the only link between these variables is their shared correlation with IQ. Similarly for the correlation between power and coordination. Such assumptions are admittedly speculative. Now converting IQ Z score into IQ is simply a matter of multiplying by 15 and adding 100. We can say with 95% confidence that if given an updated German version of the WAIS, Merkel would score anywhere from 112 to 158 (white norms). Considering we used three predictors, this is not as much precision as I would expect. Part of the problem is that Merkel’s two most extreme traits (academic success and power) are moderately correlated, thus they do not add enough independent information. Since the biodemographic prediction is uncertain, we search for psychometric data in part two. Commenter “Another William Playfair Web” asked me to estimate the IQ of Donald Trump’s chief spokesperson Katrina Pierson, and was especially interested in predicting it from her worldly success, as I had done with other luminaries. As the fiercely articulate face of Donald Trump, a man who has revolutionized American politics and is the Republican front-runner for President, Pierson has suddenly leapfrogged over the competition to become, arguably, the most powerful black conservative in America. All this from a woman who is not yet 40! I estimate there are about 31 million American adults who would be socially classified as black, and it seems about 10% are Republicans (assuming those who don’t vote would have the same politics as those who do). Thus Pierson is the most powerful out of 3.1 million black adult conservatives, giving her a normalized Z of +5 when it comes to power. Thus we’d expect Pierson’s IQ to be 2 standard deviations above the black conservative IQ mean. Let’s assume black conservatives have a mean IQ of 78 (U.S. white norms) with a standard deviation of 15, The true standard deviation is probably a bit lower than 15, but given that distributions, even for deviation IQs, tend to have fat tails, it’s best to err on the high side. Because Pierson has light skin and Caucasoid features, we might very crudely guess she’s about 75% white. Her mother is white, and I suspect her black father was largely white too. According to scholar Richard Lynn, “blacks” who are almost all white, have IQs 10 points higher than the average African American (who is almost all black). Thus, we could very crudely add 10 points to Pierson’s expected IQ, bringing her to 118 (U.S. white norms), or roughly 120. Commenter “Another William Playfair Web” also wanted to estimate Pierson’s IQ from “Idea Density” (ID) as I had done with Oprah. “Idea Density” has never, to my knowledge, been formally correlated with IQ but is seen as a measure of overall neurological and cognitive functioning. I have used the concept only sparingly, because my sense is that it only strongly predicts intelligence under very controlled standardized conditions (such as the famous nun study). One such standardized controlled set of conditions occurred when Time.com asked a sample of the most powerful women in business to submit to a Q&A, most of whom responded by email. It turns out that Pierson also participated in a similar Q&A for a different publication. I copied and pasted Pierson’s answers, ran them through a computer (with bracketed fill-in words provided by the editor removed and multi-word names replaced with place holders) and found she clocked in 0.525, which using the age adjusted norms for the powerful business women, equated to an IQ of 120. It was nice to see this independent method confirm the very crude statistical prediction made above, from her status as the most powerful black conservative, but given that Pierson was not answering the same questions as the reference group from Time.com, and given that she answered by speech, and most of them answered by email, this score should be treated with great caution. An IQ of 120 is very high, making Pierson smarter than 90% of white America. It’s worth noting that the average SAT (reading + math) at her alma mater (the University of Texas at Dallas) is an impressive 1261, which according to my formula, equates to an IQ of 126 (U.S. norms) which is 124 (U.S. white norms). Because of possible affirmative action, I’d expect black students there to average well below this on the SAT. On the other hand, Pierson not only attended, but she graduated, and with a degree in STEM (even I don’t have a STEM degree :-)) so this likely cancels out any affirmative action edge.